Stainless steel Kelly Descement's Membrane Punch produces round punches without tissue tags. Punches have serrated squeeze action handles. 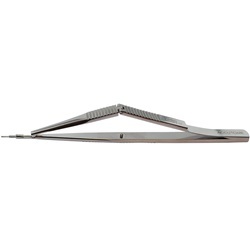 Overall length: 130mm. Produces an exact 0.75mm round hole. Produces an exact 0.1mm round hole.